Going to the zoo during the Christmas season has become another holiday tradition for our family, particularly enhanced now that we have young children to accompany us. The lights are wonderful, particularly the tree at the entrance whose changing lights are synchronized with music and include swinging monkeys as part of the show. Fake snow made of soap excited the children, and there was, of course, the meet-and-greet with Santa, which went much better this year—no more tears! In fact, after being assured that her brother would sit next to Santa, Lily agreed to sit for the photo and ended up chatting with the jolly old elf. She told him what was on her wish list: a crown, some pink coins, a water shooter, and a dust pan and broom. She mentioned the eye patch her daddy had worn when he hurt his eye. While there were some animals to see (most were in bed for the night), the biggest draw for our little girl was the plants. This was not surprising to me, because she is constantly asking me the names of every flower, bush, and tree around my yard, and just recently, she was seen reading a copy of “Better Homes and Gardens” while waiting for her gymnastics class to begin. Not only did she point to the plants and ask for their names, she requested that I repeat the answer so she could burn the names into her brain. I think I need to go out and buy a Christmas cactus. Sometimes, it’s great to be wrong. This year, Casey pulled off the ultimate surprise which is why I must write this retraction to It’s 1983 Again. I know now that you were all laughing and snickering and talking behind my back as you read my Christmas Eve post. Daddy can attest to how melancholy I have been feeling during the past few weeks. I don’t know if it was annoying or upsetting to him. I just was sad about the prospect of waking up without any of you in the house. Kelly, thank you for being nearby, but I selfishly wanted one of those movie moments with a house filled with kids returning to the nest on Christmas. This is not meant to make anyone feel guilty. We started it by moving away, but then Jamie and Casey chose to leave because it made sense to them. Jamie met her prince charming in New Jersey so she will probably stay and Casey is much happier in Maryland. And when your kids are happy and doing well, then as a parent, you know you succeeded in doing your job and you feel good. It is just a few days out of a whole year that I feel sad that we live in three different states. But as it turned out, I wasted all that dreary emotion for no reason. I knew Casey’s gift was coming on Christmas Eve, but I just thought she chose Christmas Eve delivery so I would not be tempted to open my gift earlier. When the doorbell rang, I truly was looking for a FedEx or UPS truck, not Casey and Chris. Casey, you pulled off one of the biggest surprise of my life. (I am not counting engagements and birth announcements because those occasions were not about Dad and me while this was intended as a well-kept secret about us.) My apologies to Dad on not being surprised for my bridal shower, but did he really think I would believe we couldn’t leave his place sooner because he suddenly had to defrost the freezer? It was not like he was a neat freak. Casey, you must know I was surprised because if I knew, there would have been more breakfast and beer choices in the fridge. So thank you for a wonderful Christmas present, Casey and Chris, and to the rest of you, thank you for helping them make me eat my words. 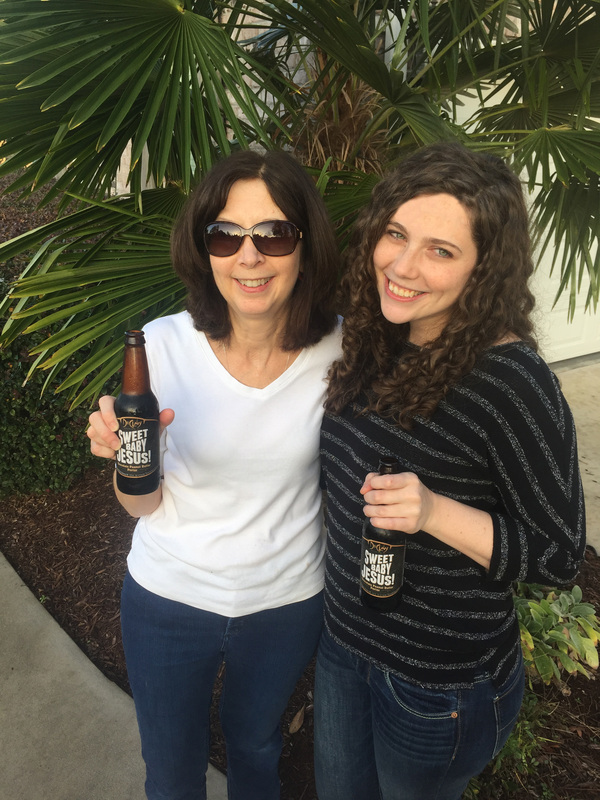 And instead of toasting each other with Sweet Baby Jesus Beer (Yes it does exist and I felt awkward asking for it) via Facetime Chat, we toasted each other in front of my palm tree together. What will next Christmas bring? This is the first Christmas since 1983 that Dad and I will be waking up alone. Thirty-two years with our homes filled with babies, little girls, teenagers, and young adults. Last year we spent the night at Kelly and Mark’s house so we could be there to see Bryce put out his cookies for Santa and watch him open his presents. 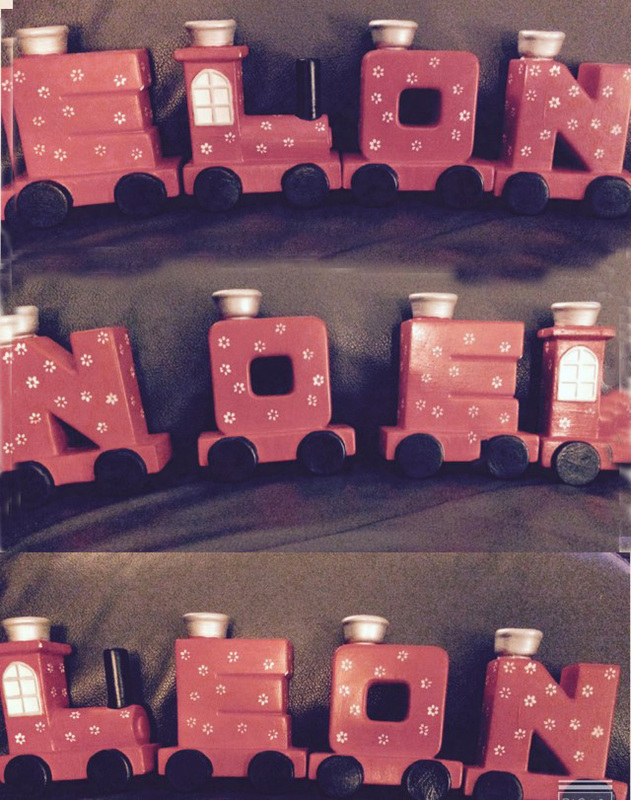 Santa brought a train table, which eclipsed every other present he received. It reminded me of the years all of you wanted nothing but to play with the boxes and wrapping paper. But this year, we’ll go over in the morning, so 2015 is like 1983 again. Those Christmases were celebrated in five states—New York, New Jersey, North Carolina, Georgia and now South Carolina. We have seen snow in all of these states. Three states gave us snow around Christmas. 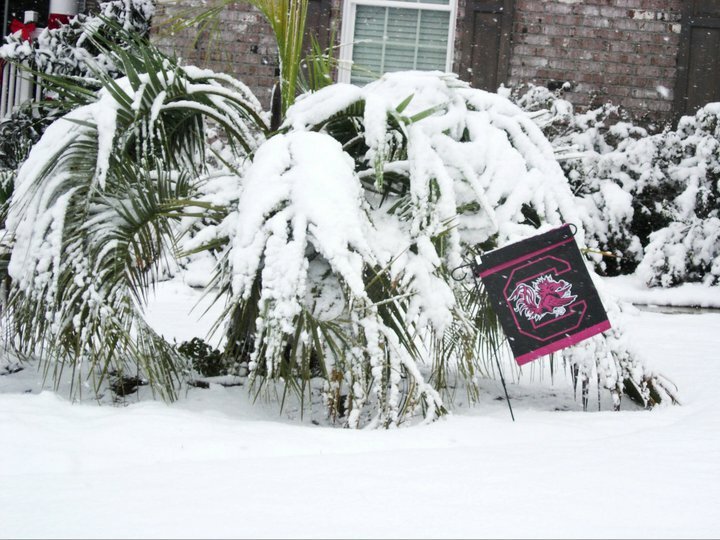 The most surprising was the snowstorm for our third Christmas here in South Carolina, which dumped five inches the day after. All of you were with us, so despite being shocked to see snow on my palm trees (should we have moved further south?? ), it was fun to recreate our northern Christmases. It took creativity to go sledding with nothing more than cardboard boxes, but they did the trick. I sent very few cards this year despite having the cards and stamps, but we received little as well. My time was filled with babysitting a lot more lately because Kelly needed the help. The new baby is coming any day now! My time was spent reading and writing, and I figured no one would notice the absence of a card from me. Like the handwritten letters, I predict Christmas cards will someday be a thing of the past. So this year will start like 1983, and then morph into 1984 when we had only one child to spend the day with. We will have to figure out a new tradition or two to fill the emptiness. Casey wants to toast the holiday with Sweet Baby Jesus beer via Facetime, which is so Casey, and Jamie, you need to either join us or figure out our own new thing to do when we are apart. I just can’t stop the changes so I need to adapt. Jamie tried to recreate another family tradition recently, which showed that sometimes a memory is best left a memory. She took Geoff to see the Christmas Ice Caverns at the Fairfield Garden Center, which you all enjoyed visiting each year. For Jamie, it was a disappointment. Was it the fact that the Smurfs are gone, or that the displays were just more magical when you were six? Or could it be that now, a three dollar fee is charged, which made the memory more off putting? Maybe it was a combination of all. I had a similar feeling when I returned to the Gingerbread Castle as a young adult and was disappointed to discover that not only was I not frightened, but Hansel and Gretel were so young. I pulled out the very thoughtful video you made for Dad’s fiftieth birthday because I remembered it included clips from several Christmases. I learned that you originally set out your cookies for Santa to the sounds of Alvin and the Chipmunks. Those were the days when Kelly carried the milk, Jamie had the plate of cookies, and poor Casey was stuck with the napkin. It wasn’t until later that we got more sophisticated and changed the music to “March of the Toy Soldiers” from the Nutcracker. Daddy has most, if not all, of your grand entrances from the kitchen into the living room as well as the video of the three of you bounding down the stairs on Christmas morning. The funny thing when watching Christmas morning through the years was that the enthusiasm began to decline as you grew older and clearly wanted to sleep later, particularly Kelly. You sold Christmas wrapping paper in elementary school, an expensive and kind of annoying fundraiser. I always purchased three rolls, and each of you chose your own pattern to leave for Santa. That way you could look under the tree and know which packages were yours without the need for tags. I wrapped all your presents weeks before, always leaving just enough on the roll to make it appear that it was untouched and ready for Santa. My proudest year, as you must recall, was when it snowed, and I decided to go outside to make sleigh and reindeer tracks in the driveway. You must admit that it was quite authentic! 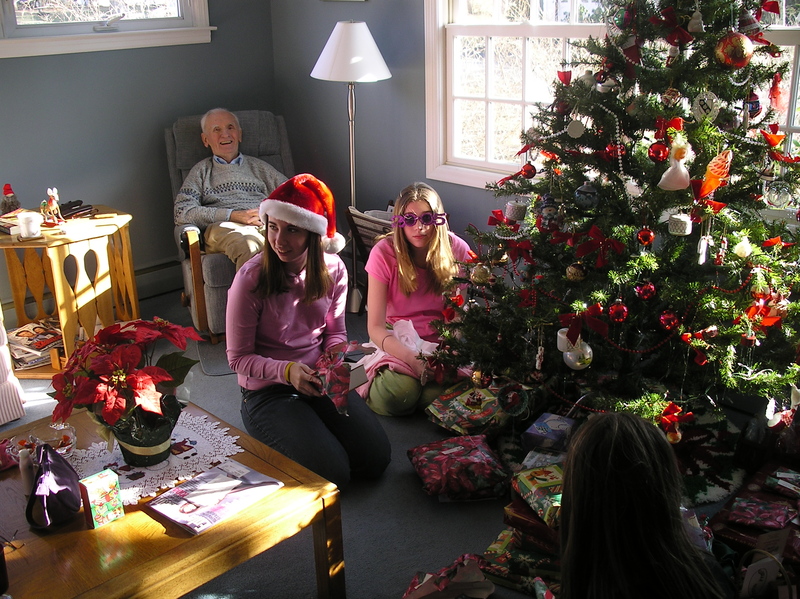 Christmas morning was always Dunkin Donuts, which Dad got on Christmas Eve. Sometime during Christmas Day, my Noel ceramic candle holders would get rearranged at least twice. Now you are all grown up, and I wonder if you will continue any traditions from our Christmases, adopt any from that of your spouses, or create those of your own? Do you hate the new tradition Dad and I started several years ago: Christmas Day movies followed by Chinese take-out or eat-in? I have lost count of how many changes have occurred through the years. I guess you just can’t stop change. 1984 was the first year our family celebrated Christmas in another state because of Kelly’s birth. She came home on Christmas Eve, and I had planned for the occasion well in advance. By Labor Day, the presents were wrapped, cookies were baked, cards addressed, and dinner was in the freezer. We had lasagna, salad, cookies and apple pie. (Did I actually bake a pie? You know I am pie-challenged!) I believe that was that the year of change #3, when we stopped going to my cousin Nancy’s house for dessert permanently. After that year, we spent the next twenty plus years in New Jersey, even traveling there from Chapel Hill several times. Every year, we always went to church on Christmas Eve. Dad came with me until we moved back to New Jersey in 1988. The changes over the years were subtle. I am basing a lot of my information on your baby books, not my fuzzy memory. 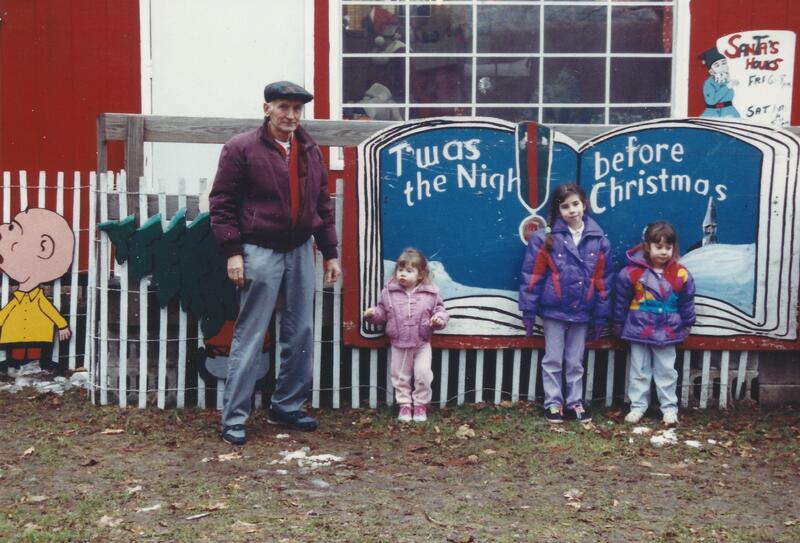 I was surprised that we had our first Jewish traditional Christmas dinner–Chinese take–out in 1986. (I thought we did not begin that until we moved to South Carolina in 2008.) That year, Santa got orange juice with his cookies, not milk like every successive year. 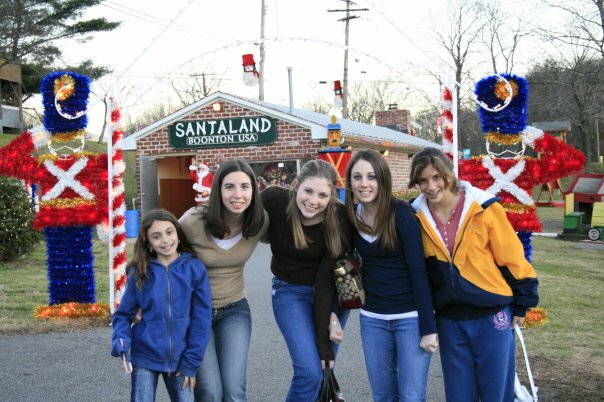 The first two years back in New Jersey, we went to Christmas Eve Mass in our new town of Montville with Grandma. 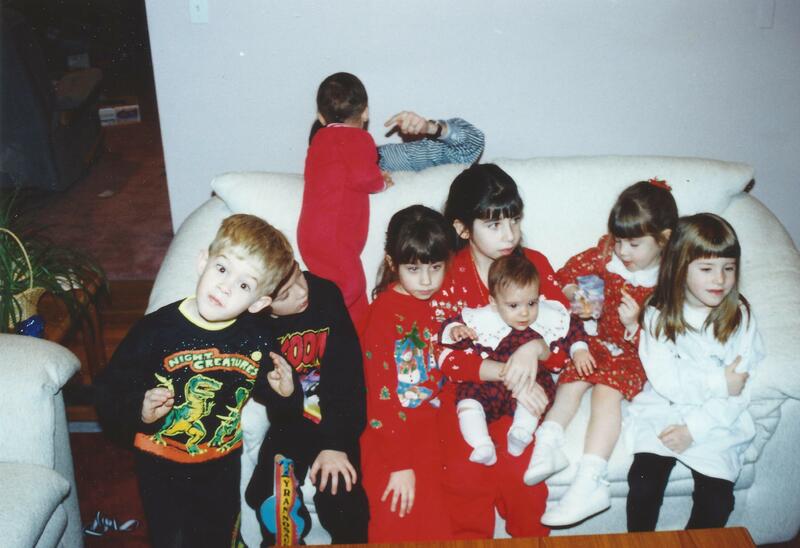 That was also the first year of your Christmas Eve pajamas, a tradition I continued for over twenty years. Even Mark, Geoff, and Chris received my pj’s at least once. 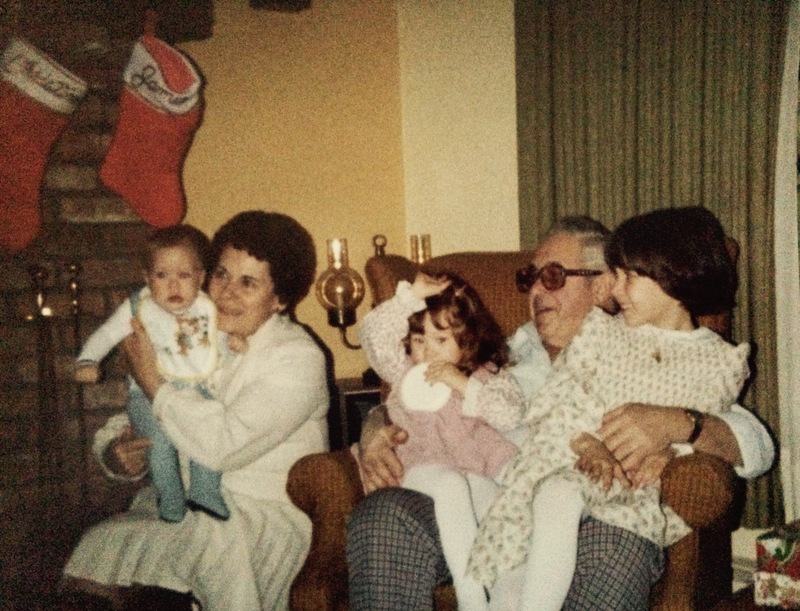 That year we began having Christmas dinner at our house, which in the beginning, consisted of just Grandma, Grandpa, Aunt El, Uncle Jim, “big Kelly” and Uncle Dave as our guests. The rest of the family joined us for dessert. The next year, 1989, was when Dad began our new tradition of serving hors d’oeuvres for Christmas Eve dinner. We went to Mass with Grandma, went to see the houses with the luminaries after church, and were greeted with Dad’s special dinner afterwards—picture perfectly displayed. The following year, Grandma asked if we could go to Mass at her church in Boonton. We agreed but then forgot to pick her up. Oops! Casey was two in 1991. After several “observation visits” to Santa Land, she finally had the courage to sit on his lap. We remembered to pick up Grandma for church, so Christmas Eve was now Mass in Boonton followed by viewing the lights after church. 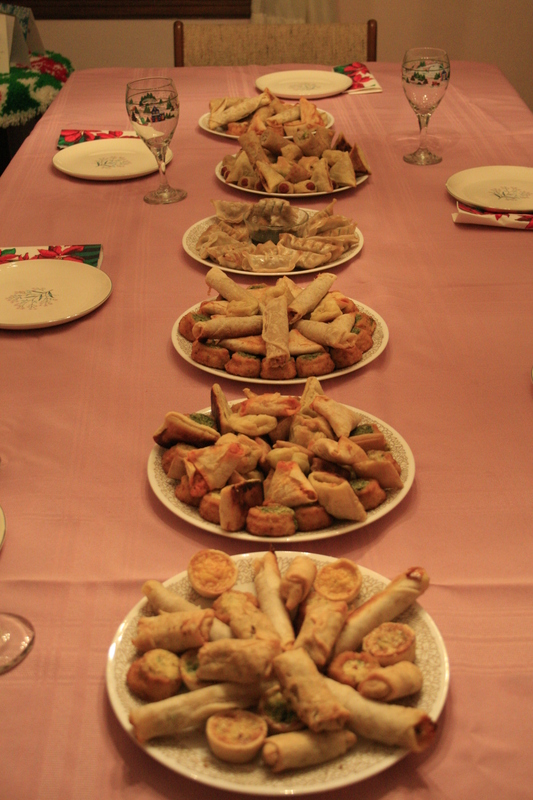 We had Daddy’s hors d’oeuvres for dinner , which became more elaborate each year. I am not certain when the Getto’s began to join us for Christmas dinner, but what I do know is that as our own “cousin explosion” began, the gift giving became more of a free-for-all. We tried one year to give out the gifts one at a time, but I don’t remember that working for us. We traveled to Jackson a few times to celebrate at Aunt Ellen’s house. I even recall Dad getting stopped for going through a red light on the way home. When he explained to the police officer that it was intentional because he had three children asleep in the back and did not want to stop suddenly, he was not issued a ticket. That was a nice surprise. During the 2005 and 2006 visits, after celebrating with the family, we played tourist and spent a few nights in New York City. 2005 was Kelly’s 21st birthday celebration and the New York City Transit strike. That was when we learned we were no longer Northerners, because we could not tolerate the cold at all. We had the “thin skin” of the south. 2006 was when we did our Times Square New Year’s Eve, which is a story unto itself because it was so surprisingly awesome. 2007 Grandma and Grandpa were both sick. We didn’t stay at their house that Christmas, but instead, took up residence at the Embassy Suites. That was our worst Christmas Eve because we traveled up there to see everyone, but ended up going out for Chinese that night, just the five of us. We decided we were probably the only Christian family in the restaurant. We felt so lonely. Eventually change #4 happened, which was when we stopped traveling to New Jersey during Christmas. That was the year we moved to Columbia—2008. We still had the hors d’oeuvres, but the Christmas Eve Mass with Grandma was now over. We celebrated Christmas early on the 22nd with Kelly, Mark, Jamie, and Casey. The two newlyweds then headed to New Orleans, so Christmas Day was now just four of us—Jamie, Casey, Dad, and me. This was the biggest change and was when I stopped getting excited about the holiday. Christmas day was Chinese take-out. After all those years of a mob of family, it was just four of us. It would get better, I hoped. I admit my memory is just not as sharp as it used to be. I like to think it’s because there is too much information clogging my brain and sometimes the auto clean-up throws away unused thoughts to make room for new information. I don’t get to choose which ones end up in the trash. Since Christmas is such a big part of our lives, I just cannot remember every single one. So I am going to do the best at recalling what happened after the second change in our celebration of this favorite holiday of so many. (See Evolution of a Holiday) Anyone from the family who reads this is welcome to chime in with their own thoughts. After the family got too large and it became too difficult bundling up all the small children and babies to visit each other, the adults decided it was time to dial it down. Somewhere during the early sixties, Uncle Rich’s family moved to Illinois for a few years, so they were easily “dumped” from the holiday visitation schedule. 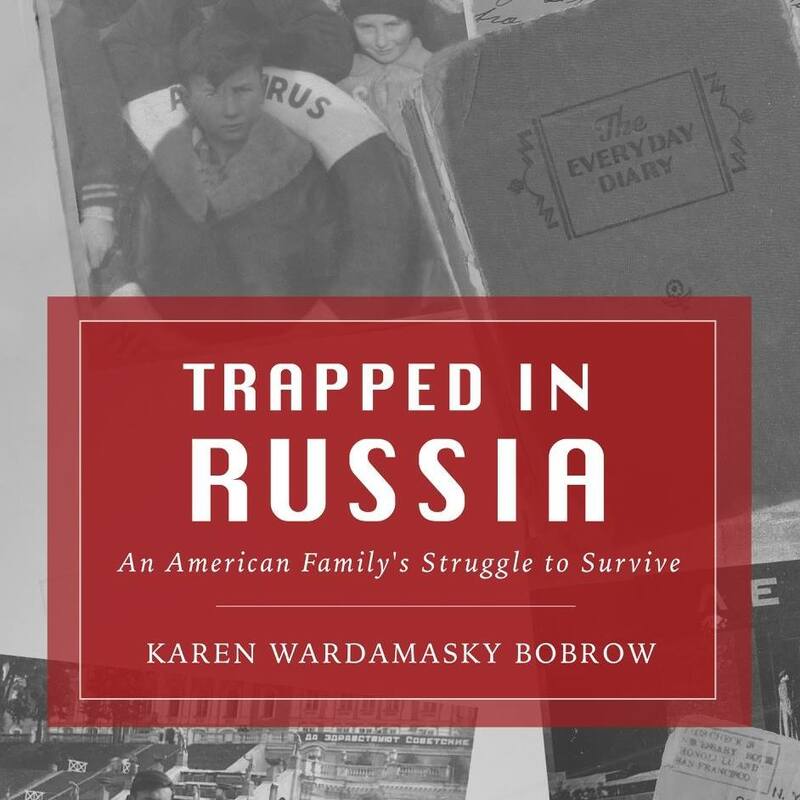 That left four families, and I am wondering if Grandma’s brothers just did their own thing and maybe celebrated with their wives’ families. So the main celebration for us became just two families—us and Aunt Marian’s family. I have vague memories visiting Aunt Marian and Uncle Tony’s house in Boonton Township, who, like us, fell victim to the tacky aluminum Christmas tree. These trees were modern, very trendy, and easily stored. There was no worry about the need to constantly keep them watered, and they had the very cool ability to change colors thanks to a revolving color wheel placed near the foot of the tree. Charlie Brown did not approve! If you are interested, they can still be purchased on Amazon or Ebay. After Aunt Marian moved two blocks down the street from us with my grandmother in 1967, I remember visiting that house at Christmas. The silver tree was gone in both homes, eventually replaced by the more realistic-looking artificial green tree. Sometime in the seventies, we began going to my cousin Nancy’s house for dessert after we opened our presents and had our early dinner of some kind of pasta—lasagna or baked ziti. We never did a turkey or ham, probably because all five of us would eat Italian food and Grandma could make it ahead of time. We probably moved the party to Nancy’s house as her family began to grow and it was a lot easier for her than packing up all of her children. Still, with thirteen children between the two families, and now marriages and another generation of children being born, it was inevitable that another change would evolve once again.